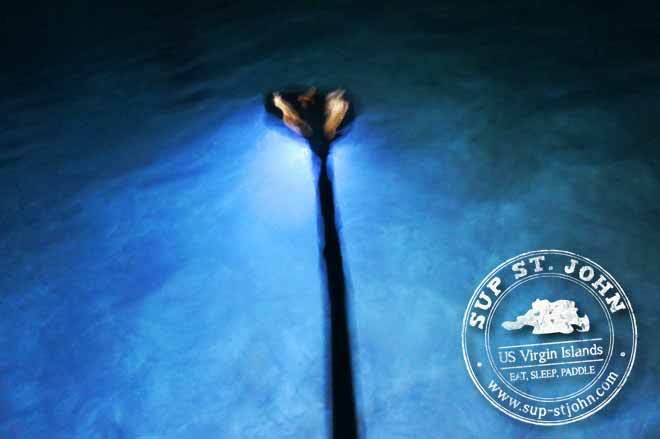 Check out these amazing Night photos, thanks to SUP-Stjohn. 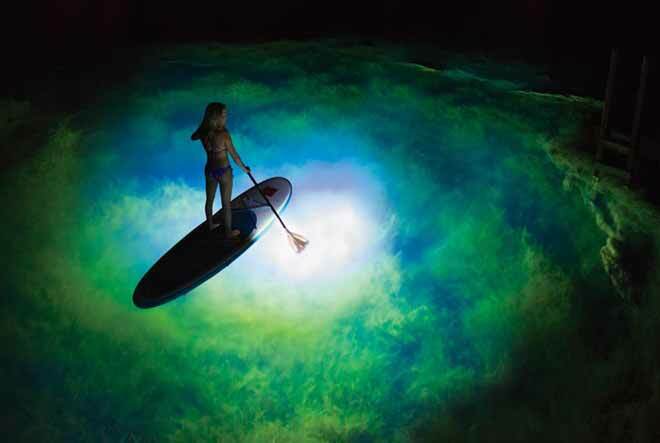 They rent out paddleboards in the Virgin Islands and have some amazing LED night paddles by Torch. Those nightpaddles are actually not some cheap gimmick but high quality carbon fiber paddles and create 720 Lumens. It is amazing how much you can see, sometimes even more than at day, due to the sun and the sky reflecting off the water into your eyes, which can overpower the view. 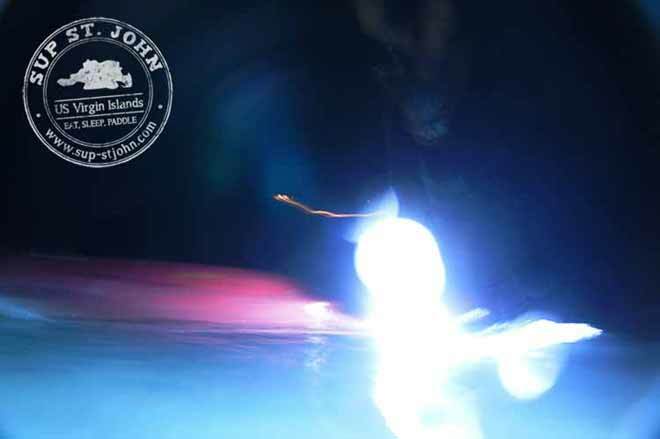 The night photos with waterproof cameras however to not do justice to the beauty of seeing the underwater world at night. Still, here are some pretty cool shots by sup-stjohn.com. Those nightpaddles are a much better option that having to buy special LED Boards. They are easy to ship and store and recreational paddlers can use those as their only paddles. We asked Jonny from Torch Paddles if these paddles were meant to be used for night only or can be full time paddles and he said they are designed for daily use. For me (being used to my beloved Quickblade 90) the handle feels a bit weird but those paddles are for sure better than the cheap alloy ones. We were also concerned about the durability for everyday use, but Jonny assured us that they are based in Utah where the climate is very hard (with 100°F in summer) and the paddles work just fine. 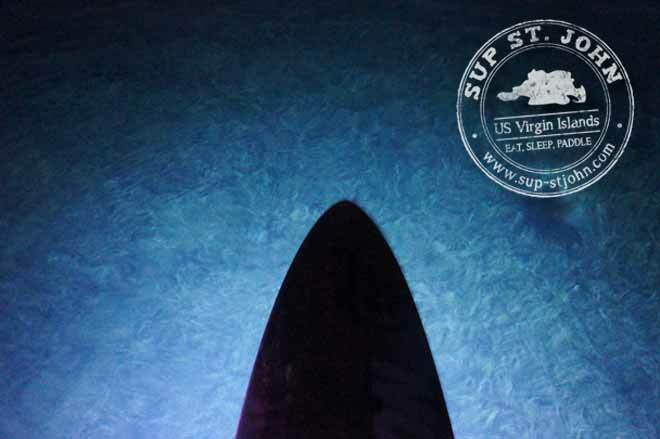 How do the SUP night paddles work? There is a little screw on top of the handle which also is the switch, you can twist it out to insert 8xAAA batteries. They create light in 3 LED strips which are integrated into the front of the paddle blade. So the blades illuminates where you are paddling but is not blinding others paddling behind you, very smart. Well this story reminds me of a Full Moon Paddle Etienne and I attempted in freezing Bavaria, only there were clouds and no moon light, we could not see a thing, pretty spooky…..